This is fully keto. You can do many things with this tart and it kind of satisfies that pizza crave. 1/2 to 3/4 cup cheese I used Raw Grass Fed Colby but Kerrygold Cheddar or any good quality grass fed cheese would do. 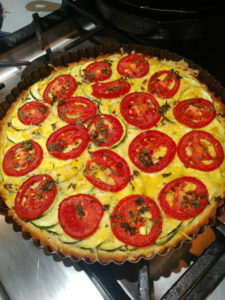 You will need a tart pan with a removable bottom and a mandoline for this recipe. Preheat oven to 376 For the Crust: Whisk the eggs in a small bowl. Add the melted butter and salt and whisk again. Add the coconut flour and mix until it comes together. This is not a pie crust you can roll out, you will need to press it into place. (You can add 2 tbsp honey, maple syrup pr xylitol for a sweet pie). Also this crust will burn easily so if cooking a regular pie..cover with foil. If filling a non bake pie ...just bake the crust at 400 for about 10 minutes. Once pressed neatly into tart pan...sprinkle with 1 tsp jarred garlic. Place zucchini in a circular style starting at outside edge and working your way to the center..carefully overlapping each slice about 3/4 way over the last. Cover zucchini evenly with grated cheese. Top the cheese with thin sliced tomatoes and basil chiffanade. Sat and crushed red pepper flakes to taste. Bake at 375 for 40 minutes. Cool for 5 minutes...remove the tart pan...slice and serve.